Children filmed as victims of the Aug 21 chemical attack in a Damascus suburb had been deliberately moved to the location from a different region after being kidnapped weeks before, Mother Agnes told RT after presenting her own investigation to the UN. Mother Agnes Mariam el-Salib and her group carried out their own investigation. They looked through the 35 videos of the incident that were posted on the internet. What caught Mother Agnes’ eye was that the same children resurfaced in different videos. “We see children in a video presented as victims of a chemical attack in Jobar. And then we see the same kids in a video out of Kfar-Batna, and they are claimed to be kids from Kfar-Batna, and then, from Ain Terma. We have seen one and the same boy ostensibly in agony in different settings,” she told RT Arabic. “Who are those children? We want to know the truth,” Mother Agnes says. RT: To start with, could you tell us a little about your team and what you do? Does your team consist of Syrians or foreign nationals? Mother Agnes Mariam el-Salib: We are a multinational group intended to assist reconciliation in Syria, as our name suggests. We have with us representatives from a number of countries including Australia, Belgium, France, Ireland, the United States, and even Malaysia. We also represent Arab countries, including Syria, of course. We are willing to maintain communication with anyone inside Syria who would take interest in mitigating the impact of this conflict for the civilian population. To that end, we are willing to engage opposition groups as well as government forces. We are committed to providing whatever assistance we can to civilians who have been aggrieved, whether by the actions of opposition fighters, or those of government troops. To be sure, we have pointed to numerous human rights violations in Syria, as those violations have been unending throughout this terrible crisis, and they have had an impact on every citizen of Syria. We must assist refugees, the elderly, women, and children. Starting from March this year, we have received several offers of support from UN offices and a number of NGOs. And we are getting some serious support. RT: Would you tell us about the study that you presented today during a meeting of the UN Human Rights Council? MA: The study I have prepared is based primarily on testimonies collected in the highland areas of the Latakia Governorate, which we visited as part of our organization’s reconciliation effort. I met with several families in the area. They told me they had recognized their children in the videos capturing the alleged victims of the chemical attack in East Ghouta. A number of other families contacted us, asking us to look into what was going on. Beyond doubt, there are large international institutions that are addressing this issue at the moment, but we would also like to contribute in our own modest way, to the benefit of the people. We have studied video footage from the scene. We have put together our graphic evidence into a leaflet that we circulate. We have looked through the first 35 videos of the incident that were posted on the internet. We tried to identify the children we had been told about in those videos. And as we looked closer at those videos, there was a surprise. We found out that the videos that the United States had held up as genuine evidence to indict the Syrian government with having used chemical weapons on its own civilians – those videos had actually been falsified. Specifically, we studied videos One, Six, Eleven, and Thirteen. RT: Do you make this argument based on your own impressions, or do you have testimonies from witnesses confirming that specific children in the videos do, in fact, come from the families you have mentioned? MA: First of all, there are family members who say they have recognized their children. They pointed to specific videos from Kfar Batna and Jobar. I cannot go into detail, because I don’t have permission from the families to mention names. So I’ll put it in general terms: as of now, we know that people have recognized some of the children. In some cases, it was a mother or a father who recognized their child in a video. In other cases, it was an aunt or an uncle, or some other relative, because some of the parents had been killed during the fighting, as the insurgents advanced through the townships and villages of Latakia. I cannot judge whether what those people say is true; that would require a DNA test. As far as we are concerned, we are trying to figure out why all those people would start claiming they see familiar faces in those videos. We look specifically at the footage selected by the Americans, and we see that it has been supplemented with footage provided by Al Jazeera, or by one of the coordination committees. We have 35 videos in our brief, but there are about 200 to 230 videos in total, each different from the others. They are peddled by a variety of sources – from local coordination committees to NGOs to media organizations. As we examined the videos, trying to identify the children in question, we noticed signs suggesting this or that had been staged and directed. For example, there is footage of a boy receiving first aid. And then there is a different video where you can see the same boy receiving first aid all over again, but in a different setting. It is like a movie production, where scenes are repeatedly edited and re-filmed. You shoot one scene, you don’t like it, so you alter the settings and you try again. RT: Are you referring to videos circulated by American media? RT: What about the other side of the story? I mean the Syrian government. It has also released videos, claiming the footage depicts the victims of a sarin attack. Have you examined those? MA: No. In fact, we are an independent group. We don’t work for anyone, we work on our own. We want to know the truth. We are bringing up this issue in whatever format is available. Today, we spoke to the UN Human Rights Council. Next, we plan to address the International Red Cross Committee. We want to know who those children are and where they come from. Those kids were apparently moved between locations. That is, we see children in a video presented as victims of a chemical attack in Jobar. And then we see the same kids in a video out of Kfar-Batna, and they are claimed to be kids from Kfar-Batna, and then, from Ain Terma. We have seen one and the same boy ostensibly in agony in different settings. Who are those children? RT: The video footage we’re talking about was circulated by the American media. But what can you say of the tapes aired by Syria’s official TV channel and other Syrian media? Have you been able to study them? MA: We’ve seen the videos provided by the opposition, which confirm that the incident took place in Eastern Guptah on August 21, 2013. We decided to watch the tapes because people told us they had recognized their kids in the footage. In fact, we spent hundreds of hours studying the footage – it’s no easy business. RT: Mother Agnes, sorry to interrupt you – but in the beginning of the interview you said that you’d been investigating cases of human rights abuse both by the government and the opposition. Could you please give us some detail? M A: Yes, sure. There is a report that has recently been filed to the General Assembly. It is to be discussed shortly. The Human Rights Violations Investigation Commission keeps failing to get into Syria, claiming that they can’t get a permit from the Syrian authorities. That’s why they cannot collect first-hand reports of all the witnesses. Back in March we cooperated with this commission, as well as the UN Human Rights Commission headed by Navanethem Pillay, and the commissioner herself said she wants to hold an investigation of her own. We met in Lebanon and talked on the phone as well, and members of the two commissions ended up asking us to find witnesses for them. That proved a major challenge. People are too scared to share any information because they think the militants might plot revenge on them. When we did eventually find the people who agreed to testify, our report got a much more complete look. Our previous report, for example, was about 60 percent more informative. Unfortunately, it was compiled at the time when many experts of the commissions were away on summer holidays. This is why we were unable to deliver the testimonies in due time. And that’s exactly when the killing spree near Latakia happened. There are over 400 people on my list of the dead. These people were brutally murdered – but the world media have been reluctant to talk about that for some reason. They never even tried to interview the survivors or the families of the victims. Their excuse for such reluctance is that they believe those people who died near Latakia were killed in hostilities rather than a well-planned raid by the militants who specifically targeted civilians. We always side with the victim. And whenever someone is subjected to violence, the whole world needs to raise its voice. And we will join in the chorus, too. In such circumstances it is unacceptable to act selectively; one cannot speak about the suffering of some people yet ignore the suffering of the others. The world media have said very little, and rather half-heartedly, about the casualties near Latakia. It was our duty to stand up and speak out, to raise awareness of this tragedy. So we hope to see the international commission in Syria. With God’s help we sent an invitation to Ms. Carla del Ponte to visit Syria. I’ve told the Human Rights Council in Geneva that we would like everybody to get the big picture of what is happening. Their report is so one-sided! It’s like a book with half of the text missing. RT: How did the council react to the report you had submitted? Did it receive a response from the members of the council? MA: Yes, it drew a wide response. Both Navanethem Pillay and the investigators have shown a lot of enthusiasm since we arrived in Geneva – they have shown a great interest in it. Every time we come to Geneva they set up meetings. Mrs. Navanethem Pillay presided over our latest meeting with the UN experts personally, which is a great honor for us. The meeting was also attended by a Nobel peace laureate, Mairead Maguire. Alfred de Zayas – the UN expert on the promotion of a democratic and equitable international order – was present at our meetings too, and he sometimes chairs them. On the request of the United Nations commission that investigates human rights violations in Syria, we held a meeting with Alfred de Zayas that lasted an hour and a half. An English expert from an international conciliation committee participated in it, too. They formulated their expectations in terms of their visit in Syria and we, in our turn, expressed our concern that the substance of their new report after they arrive in Syria might not change at all. In response they tried to assure us they were seeking to receive unbiased information. We think it would be fair if the whole world learnt about sufferings of all the victims. The world should know the life stories of all the casualties because all those people were peaceful innocent civilians. RT: Be it victims among the opposition or among the government supporters? MA: Sure. We are working for the best interests of the Syrian people. I have been to all parts of the country, except for northeastern Syria, but I plan to visit this region as well. I got an invitation from there and I hope I will be able to go there with God’s help. We stand for the interests of the Syrian people with all its ethnic and confessional diversity. RT: The UN Secretary General now confirms that chemical weapons have been used in Syria and describes it as a war crime. His report indeed can make one shudder. How would you comment on the report? What steps can your group take and why hasn’t the guilty party been established yet? MA: I have to say that I am not an expert. The experts of the commission that came to Syria were highly professional. They took necessary samples for testing and then confirmed that sarin gas had been used. I have no doubt about it. The Human Rights Committee has held meetings for three days in a row starting the day before yesterday. The organization is regarded as the major global authority on these issues. So is that appropriate when representatives of some of the member countries make sweeping accusations before even getting the conclusion of the chemical weapons experts who are investigating the case in Syria? We can’t bring charges until a comprehensive, unbiased, independent investigation is over. There are some incidents that I investigated myself. I want to know who those dead kids we saw in a video on the internet, which looked like it was some kind of a movie, were. The strangest thing was that they showed a lot of victims but no pictures of a mass funeral – we could only see burying of the eight of them. But where are the rest? If they are alive, then it is good news, and it means that the story has been fabricated. But if they are dead, it is terrible. Every parent should know his kid’s whereabouts – be it a parent from Latakia, Jobar or Kafr Batna. No matter what ethnic group a parent belongs to, he should know where his child is. Here are the photos in evidence: each victim in these pictures is marked as “unidentified.” Is that possible in the regions controlled by the rebels? They sustain the lives of local civilians and are accountable for their security in these territories. How come nobody recognized the children in the photos? People in these regions know each other well. RT: When the entire region is being shelled, whole families may be killed. Children may lose their parents and parents may lose their children. After a while, it can become problematic to identify the victims. What can you say? 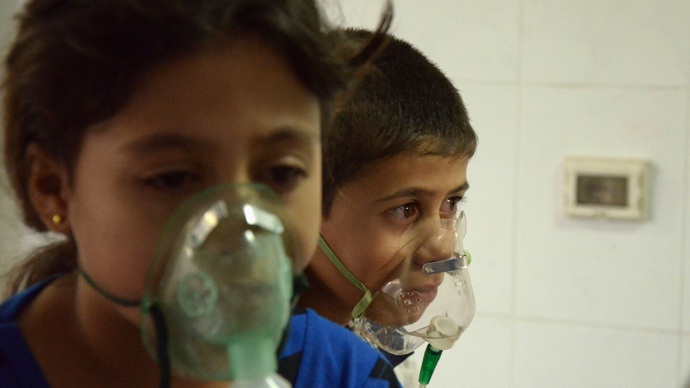 MA: It was not a bombardment with traditional ammunition – it was a chemical attack. Hospitals say people were inside their homes when the attack started. Most of them were sleeping. Given that rescuers arrived there knowing exact addresses, how come the casualties remain unidentified? Another question – where are the parents of these children? I carried out my own research of social relations in Syria and what we were shown in the video runs counter to the realities of the relations between the Syrian people – they know each other well. At present we are searching for the parents of the children. They might have been from Latakia, not Eastern Guta. Right now, we are drawing up the lists of the killed children. We demand that an investigation be held. Parents have the right to know where their kids are. We ought to find these parents in case a DNA test is needed. They are entitled to know the truth. We see it as our crucial mission. Every parent must be aware of what happened to their child, whether they are dead or alive. I’m not sure if all the bodies on the footage were bodies of dead children. Talking to the parents of those children is quite an ordeal – but we have to do it. We have to go over each of these tragedies to find the truth. Each tragedy is all-important to me. And the whole thing took such a toll on us that we haven’t had a wink of sleep in a very long time. RT: Thank you very much for this interview. That was Agnes Mariam el-Salib, Mother Superior of St. James Monastery, speaking from Geneva.